The days of talking at students are finally over. I recall many a college class filled to the brim with students feverishly taking down notes, as our professor talked at us. Recently, I finished my Masters degree in what was a new environment for me: blended classes. The experience allowed me to further communicate with my colleagues and classmates in a manner that I hadn't been accustomed to. Instead of reading each other's notes and organizing study groups, we were posting in wikis and responding to discussion board posts. Instead of learning focused on facts and statistics that we needed to figure out how to memorize, our learning was focused on what we could do with the information presented. I left this experience determined to bring the concept to my classroom, and due to the Common Core's adoption, we all need to embrace this concept. The fact is that the average American is using technology which is not only above what we in education generally use to teach, but this same technology is banned from our schools to prevent students from using it inappropriately. It's our job as educators to embrace this technology and navigate our students through it. Districts have already begun to explore blended instructional models, so to help ease any tension, here are some tips to keep in mind as you begin adopting these new teaching methods. Like most subjects, your students' knowledge in regards to technology will vary. At the blended high school where I currently teach, my colleagues and I were surprised about the lack of knowledge the average student had in regards to something as basic as search engines. Generally, I've found that my students' Internet knowledge was heavily focused on all things social networking, and that few students ventured very far outside of that. True, I had the occasional student that could hack into a supercomputer, but that student was generally rare. Realistically, you might to be forced to instruct students on how to use various mechanisms for your class. A great idea is to consider visiting the help menu of any web resource you wish to use. Most websites include a help menu and troubleshooting questions for users to deepen their understanding of these resources so that they'll continue to use them. Online textbook software is just a category of tools, so use these products as such. Many contain useful information, but picking and choosing based on need is always the way to go, rather than giving a student a computer and sitting him or her in a room. When I was an undergrad, my professors loved PowerPoint. They all used this medium as something we were to look at and take notes with. I couldn't remember any tangible information from them if I tried. I only remember their existence. More and more, I've become better at using my PowerPoint to guide students through my lesson plans. I can then make an amended version of that presentation and post it online for my students to access as a resource. Using your PowerPoint to foster and control the flow of the classroom is a great way to lead your students from a vocabulary list to an anticipatory set. They then expect the PowerPoint to guide the lesson, rather than groaning at the return of a torture device that will force them to take more notes. It's no secret that getting students to converse using the vocabulary, information, and concepts you're teaching them will foster deeper understanding and add meaning to their lives. Let them create memes, or show them how discussion board posts are like Twitter updates or Facebook statuses that their peers can comment on. Let them contribute research to wikis, create websites, and make PowerPoints for their presentations. Now more than ever, the Internet is rife with collaboration tools for students at just a push of a button. Google Apps for Education and Blackboard are two of many varying platform types that allow students to collaborate. The days of talking at students are almost over, as research and many of our collective personal experiences deem that to be an ineffective method of instruction. 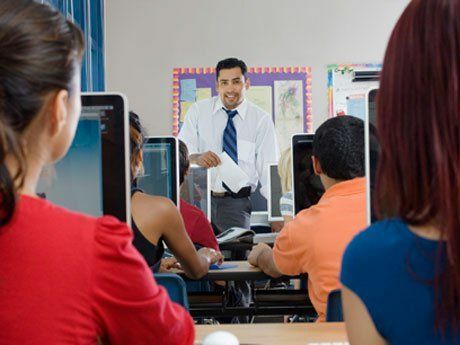 Blended instruction gives students investigation, real-world application, and immediate relevance with each lesson -- and even more so because of the educational technology advances that the Common Core will usher in. It's best to not spend your time memorizing this information. Please just use it.